As we have seen in recent years that smartphones are getting bigger with each passing day, therefore designing UIs for smartphone apps is relatively easy. However, UI designers have a new challenge ahead of them as smartwatches are making their way into the market. It is understandable that the new smartwatches will be smaller in size, because of convenience and durability, the face of a watch needs to fit onto our wrists. One thing that we have learnt through the Apple Watch review on Tech Crunch is that it will be really handy to notify users of different things. That is why it is important for UI designers to create UIs that will help users to get the most out of their notifications and alerts. In this post, we will analyze why readability will be a key factor in designing UIs for smartwatches. So, let’s dig in. 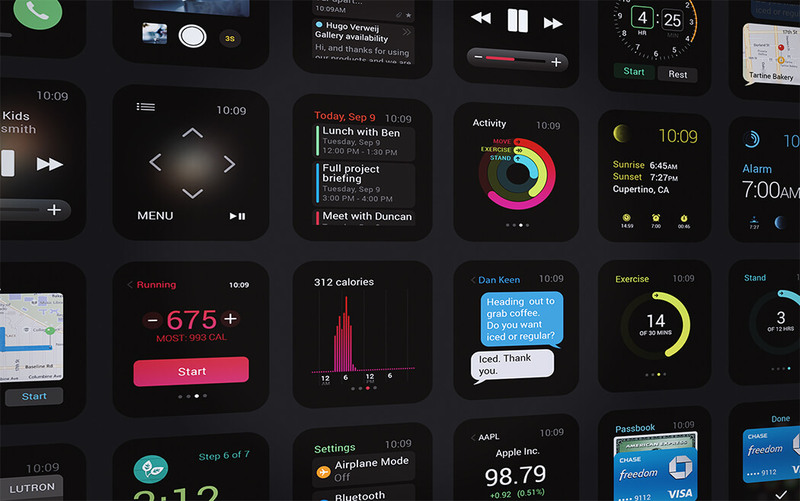 Apple Watch has introduced ‘Glance’ as a new way of interacting with the smartwatches apps, which is pretty reasonable considering the fact that holding a smartwatch for a longer period is difficult as compared to holding a smartphone. Smartwatches will be too small to spend long stretches of time interacting with them, therefore we have ‘Glance’ as a new click. Glance, as defined by Apple, a template-based screen view, not scrollable, associated with a single action and optional. In simple words, Glance is a quick look where speed is part of the interaction with the wearable. For example, when an Apple Watch app notifies you about a happening, you will feel a single tap on your wrist, then you look into your watch’s screen, the app will show you a brief part of the information, holding your glance a little longer will encourage the app to show you the details of that notification. These “glance” screens, hold information meant for fast consumption, and most information is very likely to be text-based. With details discussed above, it is clearly evident that text readability and clarity of information design are key to the success of these devices. Consider the frustration of looking at a watch and having to hold it up close to your face because the interface is too busy or the text is too small to read. The success of a wearable device will be in seamless interaction and how consumable these glances are. Brands and advertisers will need to work harder to grab users attention, and readable type is key. To make sure that we can read what is required in each glance, design optimization is vital. The size of the text will be an important factor in creating an effortless and seamless experience. Smartwatch distance from the eyes will be an important factor, while considering this feature. Another important factor is the amount and density of text on screen. On average, a user can read 4 words per second. So, how much information will we access in a glance?. Using short and frequent words as much as possible will be a handy tip for UI designers. We are consuming text through text messages, emails, push notifications, and alerts. Glance is the new way to grab our already divided attention. In this post, we have seen how text readability will be a key factor for designers while designing UI for smartwatch apps. The key is to create a UI that will deliver messages quickly and effectively to consumers while utilizing glance-based communications. How to Design Customer Oriented Websites?